This book captures a moment when the competing ambitions of the Mughal Empire and the English East India Company brought them into armed conflict. 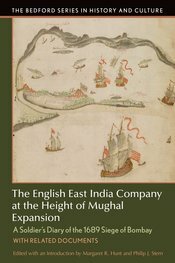 The central document is a previously unpublished diary by an English officer who participated in the 1689 Siege of Bombay, a sixteen-month battle between English and Mughal-allied forces, which devastated the island and threatened the very foundations of English empire in western India, almost before it even began. Revealing much about seventeenth-century warfare and social relations, the diary and the two dozen related documents collected by the editors deliver new insights into encounters not only between the Mughals and the English but among a number of competing South Asian and European companies, states, and empires as they sought political and economic power in the Indian Ocean world. The introduction provides the broad historical context for the siege, and students are supported by document headnotes, gloss notes, a chronology, questions for consideration, and a bibliography.